In this latest chapbook collection, internationally renowned poet, naturalist and lecturer David Morley explores the arcane and the simple, the flowing and the still dimensions of fauna and flora. 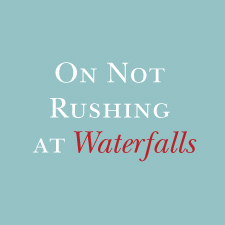 On Not Rushing At Waterfalls contains some of David's more experimental work, including a series of caligrammes that have been recreated as natural sculptures in Strid Wood, Yorkshire, as well as 'traditional' poems like 'Barden Tower'. A must-read for any fan of poetry, the world around us, or anyone who just enjoys great writing.